Yay stress baking! Yes, it was one of those weeks. One in which baking things with insane amounts of sugar was the only real way to deal with my life. 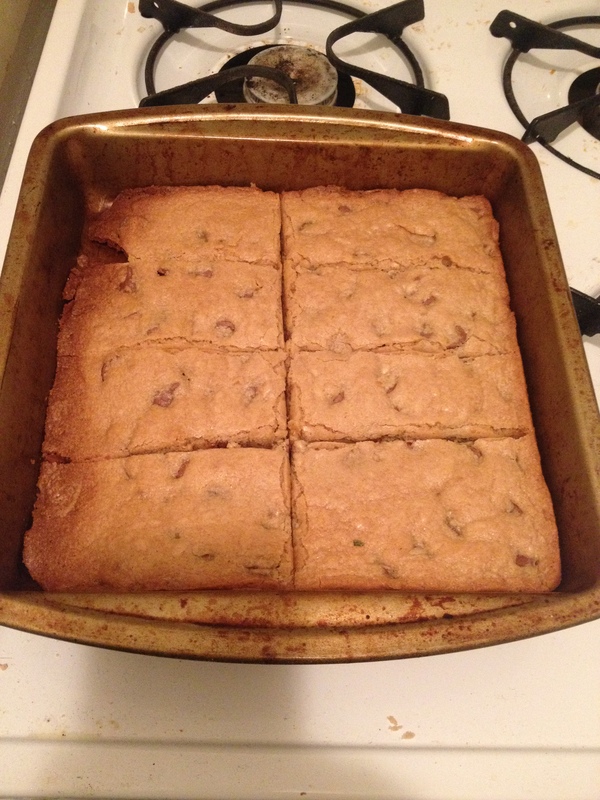 For some time now I’d been intrigued by the concept of blondies, figuring that adding chocolate chips would satisfy my need for chocolate while still having me try something new. I didn’t even really bother doing much research, I just pulled together a slight modification of the first recipe that came up on a google search. Eh, I figured with all those ingredients, there was no way it could turn out badly. They were good, but not great. Too chewy from all the brown sugar and tasted almost nutty, which I have no idea how that works when there was nothing remotely nutty in them. I’m happy I made them, and will enjoy eating them (I didn’t even bring the leftovers to work) but I doubt I will repeat this recipe. Song of the week, Problem by Ariana Grande. I already loved this song, but have been obsessively listening to this song all day. Is there a connection between this song and my stress baking? Distinctly possible.